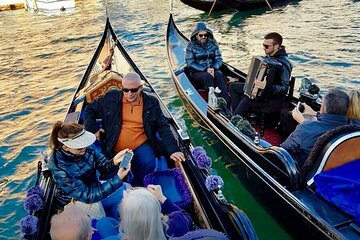 Experimenta la magia de Venecia en un paseo en góndola con serenatas por el Gran Canal y más. Un gondolero lo guiará a través de los canales históricos de Venecia en una góndola tradicional elegantemente tallada, mientras los músicos locales le dan una serenata con los sonidos tradicionales de Italia. Un paseo en góndola es la manera perfecta de experimentar la Venecia por excelencia y ahorrará dinero reservando un recorrido compartido. Vea Venecia de la forma en que debe verse, desde un asiento en un bote en góndola. I’m expecting a gondola ride with serenade but it was actually only a gondola ride among a group of gondolas with one carrying the performer. For the price, for a group of 4 like us the cost is double the rate if we had rented a private gondola. I felt we were shortchanged. The Information of this tour is misleading. Although it states that the Gondola is a shared Gondola, it does not state that the musician is also shared. It was my understanding that there will be a musician on our Godola but I was surprised that there was only one musician for a group of six Godolas. We did not enjoye the ride because the Gondola with the musician was far from our Gondola. The information should state that this is a shared Gondola and shared musician. Had we known this, we would have not booked this tour. We had an exclusive Gondola tour just me and my wife which was much better and cost less. Amazing tour, just 1 remak.... we arrived at the line very early 1.5 hrs before to get the place we wanted in the gondola, due that there are only 2 main places on a gondola 6 places total: 2 main seats, 4 side seats. at the time of the tour the administration guys told us to move to the other side of the entrance and........NO ONE FOLLOWED THE INITIAL ORDER OF THE LINE, so we had to squeeze into the crowd to try to get a good place not cool, fortunately we got one of the main seats we wanted and the rest was very nice, the musicians are excellent and the tour has some awesome landscapes of the city.